"How to Write Better Resumes and Cover Letters"
The stodgy, old-fashioned typewritten résumé is a thing of the past, and here's the brand-new approach that will propel you toward career success in today's job market! Easy-to-use worksheets help you organize your job qualifications and career experience to make the best possible presentation. You learn to take full advantage of career planning internet sources and college career service centers. You learn the differences between paper résumés and electronic résumés and discover how to prepare each. 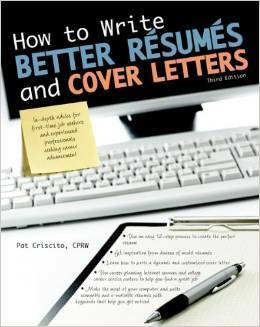 You learn how to sell your skills in a cover letter, using dynamic sentences, keywords, and power verbs. Finally, you learn how to prepare scannable and e-mailable résumés, include photos and references when required, select appropriate type faces and paper colors, and master all the details that will make a great impression on a prospective employer. Dozens of model résumés will inspire you, whether you are a first-time job hunter to or an experienced professional looking to advance your career. To order an autographed copy of this book, call (800) 446-2408.